In April of 2016, CMC professors Zachary Courser, Eric Helland, and Kenneth Miller convened for a Dreier Roundtable Conference at Montpelier, the Virginia residence of James and Dolley Madison. 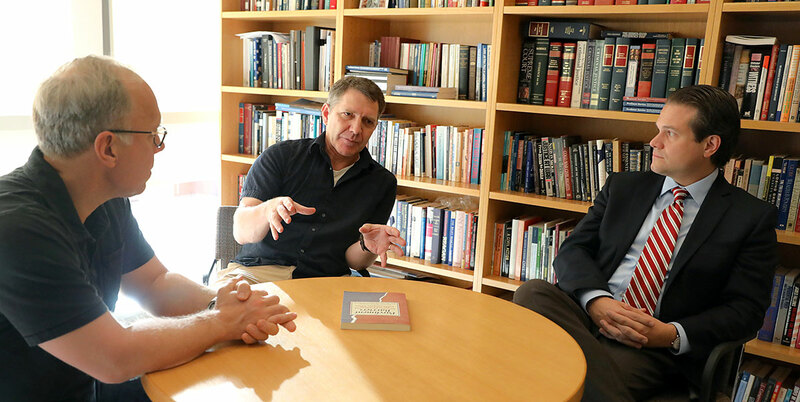 The trio had already organized a conference at CMC earlier in the fall on political polarization and the Constitution. But being at Madison’s home made their mission clearer. After all, Madison wrote about the threat of political faction in the Federalist Papers and advocated for a constitutional structure that was more than “parchment barriers”—mere words on paper. The people must share in the defense of the Constitution, he argued. While at the conference, the three professors and several Roundtable participants solidified their Madisonian bond moving forward. Per tradition, they brought a bottle of Madeira wine to Madison’s grave at midnight and made a toast in his honor. It was the least they could do for the “Father of the Constitution,” who helped inspire their co-edited volume, Parchment Barriers: Political Polarization and the Limits of Constitutional Order, which came out this fall from the University Press of Kansas. How did the three of you land on this topic for a book? Courser, Visiting Assistant Professor of Government, Research Director of the Dreier Roundtable: We saw polarization as a problem before the 2016 election. As we were thinking about what the theme of the Dreier Roundtable would be for 2015, we didn’t feel like many scholars were focused on the question of the constitutional roots of polarization. We started thinking more deeply about institutions and constitutional norms—basically, what is the role of the Constitution in shaping institutions, and how is polarization affecting that? We invited a diverse group of scholars from a variety of disciplines, and came up with the broad outlines of the book. Being at Montpelier, trading papers and ideas together, really helped the final product. Miller, Associate Professor of Government: We were intentional about making this book distinct by addressing the underlying theory of American government and constitutional structure. Other books don’t really do that. They might focus on what a party votes for in Congress, how voters fit into the two-party system, things like that. We wanted to go deeper. The book’s unique contribution is that it features what our faculty focuses on. CMC professors look at the theoretical framework of our system of government, not just the contemporary politics in play. Did the current state of political polarization influence your approach? Courser: In the past, most Americans were fairly moderate on most political issues. You could be committed Democrats or Republicans and vote that way, but if you examined where most people stood on issues, it was pretty much toward the center. The median Republican and Democrat were fairly close to one another in their ideological views, but over the last 15 years, you can watch these two groups just come apart to where you have no one in the middle. The two groups on either side have become very distinctive from one another, with little overlap. Not only is there strong partisanship, but there are now polarized ideologies—and they’re very separate and unyielding. Helland, William F. Podlich Professor of Economics: To put it a slightly different way, the fact that you know somebody’s opinion about abortion now means that, with a high degree of certainty, you know their opinion about eight other things. Whereas in eras before, that wouldn’t have been the case. You would not have known how cross-cutting issues—opinions on the appropriate role of government, the tax rate, something like that—would necessarily correlate to views on abortion or whether you thought the original interpretation of the Constitution was better. Increasingly, that has been separating. What are some other tensions you wanted to examine? Helland: As the non-political scientist in the group, the thing that struck me about the project, both on the left and the right, is that the Constitution is often seen as an obstacle to the thing they want. In the time that we’ve written this book, there have been a number of instances when we’ve seen or heard, ‘Oh, what’s thwarting whatever good thing our side wants is some constitutional provision!’ For instance, we’re having discussions now about whether the Senate is representative. The Senate was never intended to be representative. It accomplished a different purpose. So, it’s interesting to me that the Constitution is almost seen as a hindrance now as opposed to a system of governance designed to unite us as a nation. Miller: How durable is this constitutional system we’ve created? That’s one of the questions the book asks. Something like the Senate, which runs against the concept of pure majority rule, or the electoral college, where the popular vote winner doesn’t win the election—there’s a lot of talk about them now. These ancient political systems are under a lot of stress because people really care about outcomes. About winning. And these institutions are getting in the way. So why keep them? It just so happens that it’s difficult to change the Constitution, so I think this is only going to continue to be a source of political contestation, debate, and frustration. What do you hope the book will help with in terms of a larger conversation about polarization and constitutional order? Courser: Is there a way forward? I really hope that we can help make the Constitution a more central question in our debate about polarization and the future of our political institutions. Because right now, it’s not at the center. It’s at the periphery. Miller: Certainly, I think the core principles of the Constitution are enduring. I also think that being adaptable is part of its genius. The Constitution has been able to absorb a lot of social change and growth in this country in the past two-plus centuries. But if you lose the core principles, I think there’s a big loss. Courser: I appreciate how the book ends on an ambivalent note about polarization. We are reminded that American politics has polarized in the past for some good reasons like establishing democracy, protecting equality, and ending slavery. From our perspective today, polarization seems to have smaller, narrower political goals, yet we may hope for some popular consensus to emerge that will help resolve this conflict. We hope that consensus will establish a stronger republic and a deeper commitment to the principles of the Constitution.